Terre And Resort Is A Luxurious Five Star Resort! This four star resort is situated just 10 kilometers away from Marrakech and sits beautifully amidst 12 acres of palm and citrus trees with dotted grounds. You may visit the desert for some adventurous safaris or hike about 60 kilometers to the Atlas Mountains. 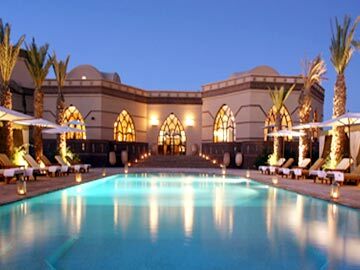 This hotel is luxurious with octagonal style mansions built in old Moroccan architecture. 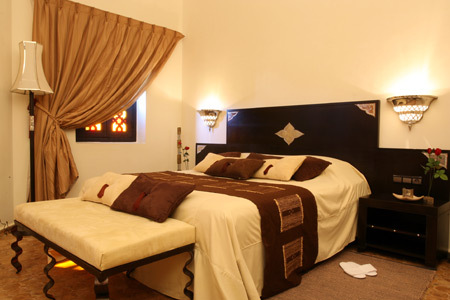 It comprises of 52 air-conditioned suites with traditional Moroccan furnishings, arched doorways and red and dark wood furnishing. The rooms are spacious and spotlessly clean. They are well equipped with modern amenities like Minibar, safes and bathrobes. There are Romance, Princess and Junior Suites. The larger suites have separate dining and study areas. The resort restaurants are popular for their superb blend of Cuban and Moroccan dishes. For the business travelers, there are conference and banquet rooms with all audio-visual equipments to conduct their meetings and presentations. Wireless Internet is also available. For the tired minds and bodies, there are some unique treatments at the Spa like the Moroccan body wrap, massages, hammam and even a hair salon. The hotel offers various facilities like swimming pool, clay tennis court, golf- putting range etc inside its own premises. Not far from the resort is an 18-hole golf course, where you may spend your leisure time. There is even an ideal location, where migrating birds flock in large numbers.